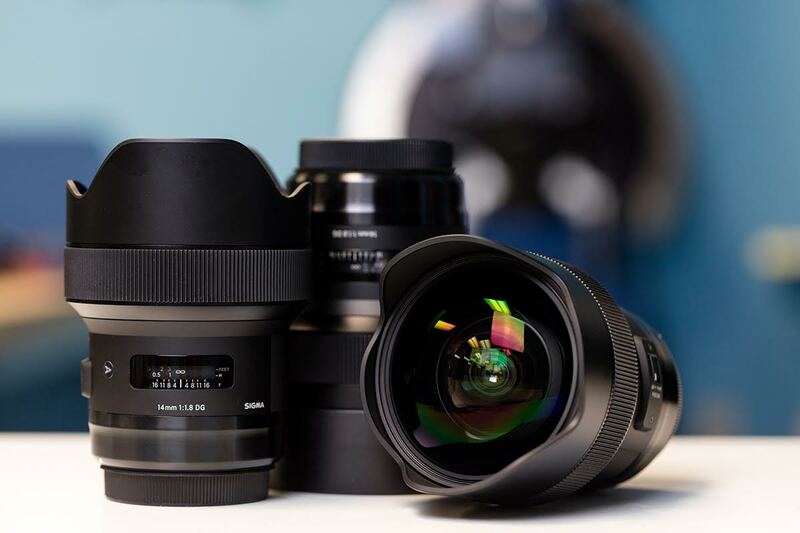 We’ve had a number of fun, new lenses to test this summer and one I was pretty eager to get to was the Sigma 14mm f/1.8 Art, for a couple of reasons. First of all, it’s a 14mm lens that has a wider aperture than f/2.8, and that’s certainly interesting. Second, it’s a new Sigma Art prime lens, and those have been spectacular. So I begged and threatened and got the first ten copies for some bench testing before they went in stock. 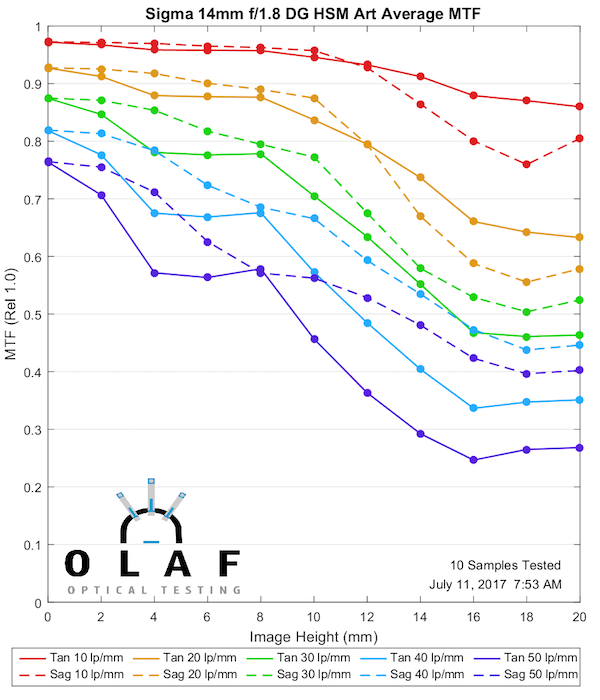 As always, these are optical bench tests, so take them for what they’re worth. It is not a lens review because I don’t review lenses. That’s what photographers do. I test them, because, well, I’m a tester. 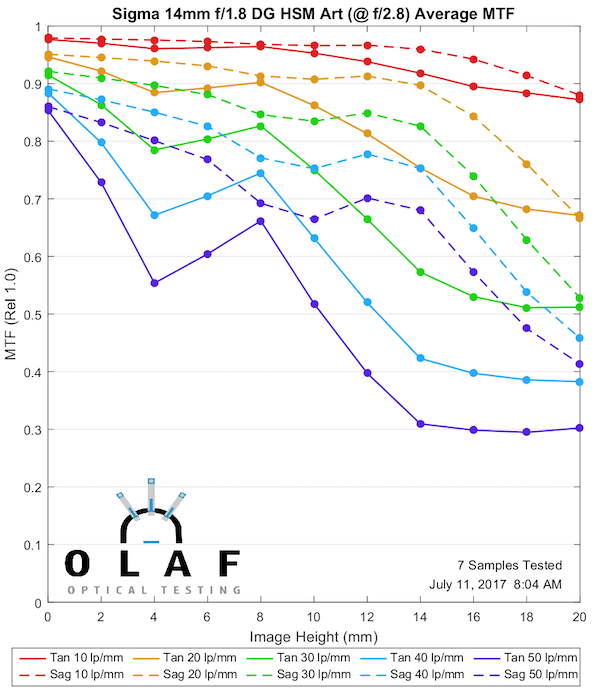 Test results should tell you if the lens is worth consideration and further investigation, not that you should run out and buy it. I don’t make any suggestions about what you should run out and buy because I have no idea how you shoot or what’s important to you. But if the resolution is important to you, then read on. As always, these are the results of 10 tested copies; each tested at four rotations with 84 data points. For those who don’t speak MTF, the easy version is higher is better, and dotted and solid lines of the same color close together are better. 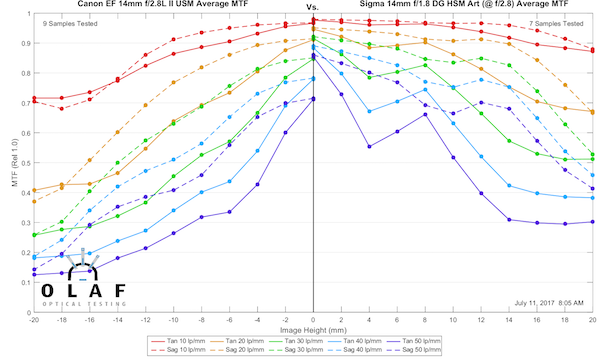 I was curious about how well the Sigma 14mm f/1.8 Art lens would perform at f/1.8. 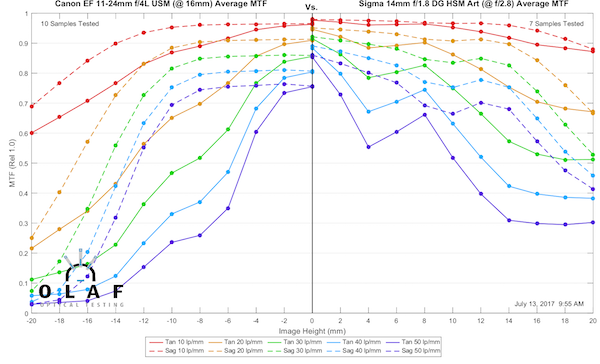 Sigma has an excellent track record with the Art Primes, but there are good reasons other manufacturers are limiting themselves to f/2.8 apertures at wide angles. But the performance wide open is impressive — this is sharp even wide open, even at high resolutions (blue and purple lines), and even at the edges. As most of you know, I usually don’t test stopped down, but I did this time. 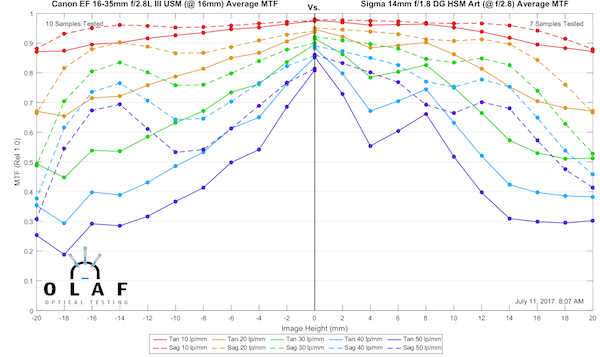 Partly because I am aware, despite my begging and pleading, that Fanboys LOVE to take the wider aperture MTF and compare it to the narrower aperture MTF of a competitor’s lens. That’s especially true in this case where the competitors don’t reach f/1.8. So here is a set of Sigma’s at f/2.8. (I only tested the first seven at f/2.8, because, as William Gibson said, time be mos’ precious, mon). Two things you’ll notice. First, this lens is getting scary good in the center at f/2.8. The second is Roger’s 12th Law: Stopping down doesn’t make everything better everywhere. (OK, actually this is because some aberrations improve a lot, some a little, and some not at all when you stop down. But since most of y’all hate math, I just decided to skip the math stuff.) This is true of all lenses; you just don’t see it often because I don’t do stop-down tests often. As long as we’re testing things, I probably should show you the field of focus, since that gets, well, interesting on wide-angle lenses sometimes. This isn’t sometimes; this is a very flat field with just a slight curve. A lovely, fairly flat, boring field of focus curve. I’m making the comparisons at f/2.8 to try to even the playing field as much as possible. The obvious comparison is to the Canon 14mm f/2.8 L lens since they’re both 14mm primes and all. 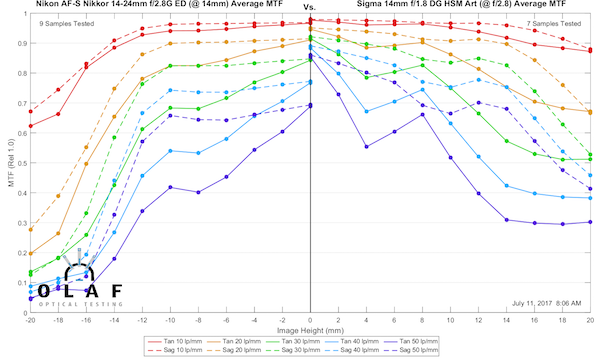 The Canon is a significantly older design, and that shows, the Sigma is clearly better everywhere. The Nikon has been the gold standard of wide-angle zooms for a long time, so this is a good comparison. We’d expect the Sigma to be better, it’s a much newer design and a prime lens, and that is indeed the case. The Nikon is still a very impressive zoom, though. I won’t bore you with lots of zoom comparisons, and this one isn’t really fair; 14mm is a lot wider than 16mm and zooms aren’t supposed to be as good as primes. But the Canon is the current wide-angle zoom champion, as good as it gets at 16mm, so I thought it was worth a look. 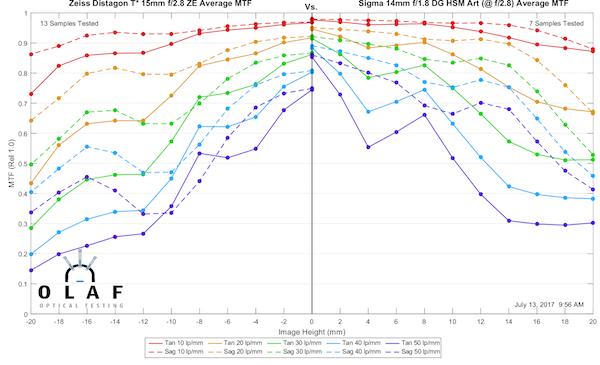 I think this is so close that sample variation would be larger than this average difference everywhere except right in the center where the Sigma is better at high frequencies. So, Canon shooters can choose between the zoom that is amazing at f/2.8. Or, the prime that is a wider angle and wider aperture f/1.8. Horses for courses. Choices are good. All that stuff. So This Changes Everything, Right? Nope. Let’s face it, there hasn’t been an impressive 14mm prime for SLRs for a while, and I haven’t heard the natives banging on the castle doors demanding one. But for some people this is going to be a really fun lens. I consider it reasonably priced for what it is; a unique and excellent lens that hasn’t been made before. I shot real-estate for a brief moment in time, and I would have killed for this lens then. And I like playing with ultra-wide images in general, so I’m kind of excited about it. It won’t be a huge fraction of my images, but it will be a tool I didn’t really have before. A lot of people will never shoot 14mm and will never notice this lens exists. But for those who do, the Sigma 14mm f/1.8 Art Lens is probably going to be a fascinating lens indeed. Seems like the Tamron 15-30mm would have been a good comparison point.